Setting surgery trays up properly in accordance for the type of surgery being conducted is a valuable and important step in any surgery. Surgical technicians know that correct setup and arrangement of the surgical tray allows the surgeon to not only perform the surgery more efficiently, but allows him to have all his preferred surgical instruments easily assessable. Proper sterile precautions of surgical instruments plays a key role in the patient's post operative health. Every surgeon and surgical procedure has special instructions for instrument preparation above basic instrument setup, therefore it is imperative that surgical technicians understand each specific surgeon's requirements for proper surgical tray arrangement. Set a Mayo stand and tray directly to the right of the scrub nurse or scrub physician who will be assisting in the surgery. Put on sterile gloves while setting up for any surgical procedure. Cover the Mayo stand and instrument tray with a sterile drape by carefully opening each side. Avoid touching the inside of the surgical drape where the instruments will be placed. Open carefully the basic sterile instrument setup for the surgical procedure that is being done. Once the package is opened you will need to re-glove in order to place the individual instruments on the tray. Look at expiration dates, sterilization indicators and packaging before opening and placing any surgical instruments or equipment needed for surgery. Place the instruments carefully, handle first on the sterile drape using proper sterile technique. Make sure that nothing contaminates the sterile field or the sterile instruments. Arrange the instruments accordingly to the specific surgery and surgeon's requirements, do not overlap instruments or overcrowd instruments. Each surgeon will have certain instruments she prefers. Place sterile gauze on the sterile tray and a fenestrated drape. Place on the utility stand any other additional surgical equipment that will be needed for the procedure. Place a sterile surgical basin in the ring stand next to the Mayo stand. Place duplicate or additional unopened sterile instruments in the surgical theater in case they are needed quickly. 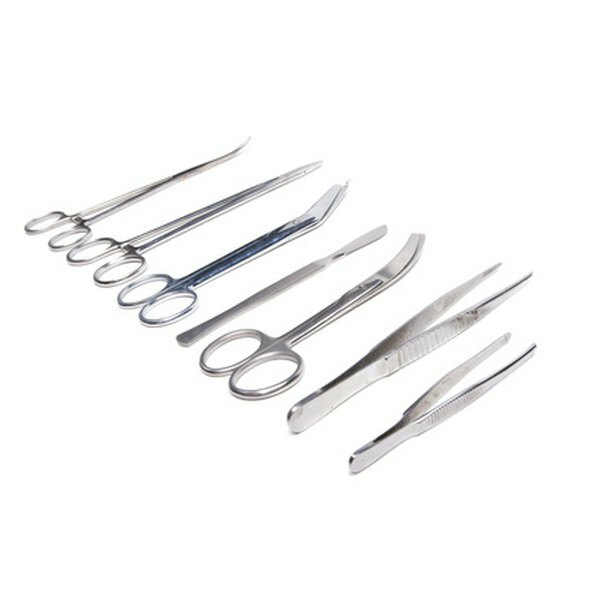 Prepackaged instrument kits have all surgical instruments enclosed and the instrument packaging. once opened. becomes the drape for the Mayo stand. It is recommended that instruments be set up as close to surgery startup time as possible. Re-glove as many times as necessary to avoid cross-contamination. Make sure you have appropriate instrument knowledge on all surgical procedures. Any contamination of the sterile instrument field requires a complete new instrument setup. Sterile surgical instruments should never be covered.